Claire’s Mom – I wanted to see more of her. 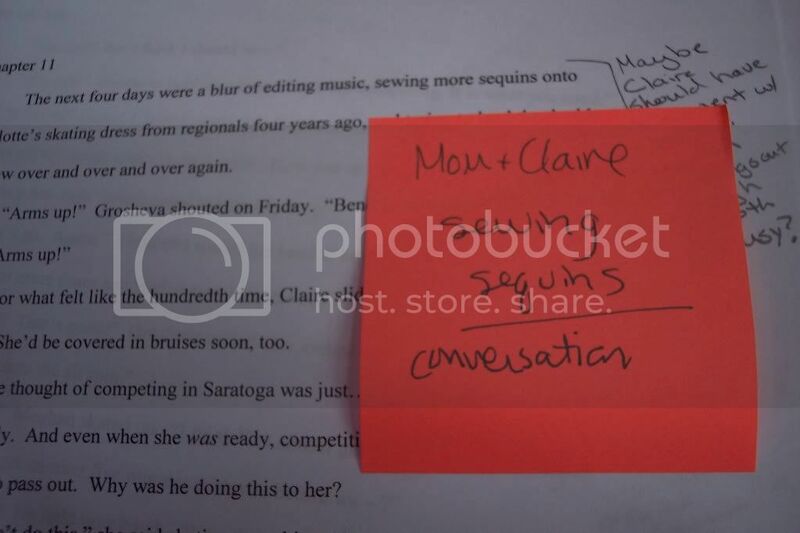 Claire spends a lot of time away from home, but I think the addition of a scene between them would help us get a better idea of who Claire is and where she comes from….. What does her mother really think of all the skating? What would her mom say about how Claire has changed? And so I started adding a new scene with Claire and her mom together in the kitchen of their farmhouse. They are sewing sequins onto Claire’s skating dress, and Claire’s mom looks at her and says…. Because I’ve just realized that I don’t know Claire’s mom the way I need to know her to make this scene real. I know the "Mom-of-the-moment" and how she spends her days, but I’m not entirely sure who Mom used to be. That feels important now, before I can move forward. Right now, Mom’s whole life seems to be Claire and the boys and the maple farm. Who was she before? When she was 16, before she met Claire’s dad, what did she want to be when she grew up? She loves the maple farm, loves the work her family does there. Why? What does Mom think about while Claire is skating in Lake Placid? What are her worries? What is she hoping for Claire? What was Mom’s relationship with her own parents like? What makes Mom feel talented and special? What used to make her feel that way when she was a teenager? Did Mom have a dream she didn’t get to follow or chose not to follow? What changes has Mom noticed in Claire since she started training in Lake Placid? Mom is a listener, but Claire hasn’t had time to talk much about all this. What has Mom heard from her? And what is she wondering about? Time to shut down the laptop for a bit… This part of the process is a pen and notebook thing for me. What about you? What are your favorite strategies for making secondary characters ring true? This entry was posted in Uncategorized and tagged revision, sugar on snow. Bookmark the permalink. Both comments and trackbacks are currently closed.